Here various kinds of fonts are available. You can choose any one of them for free. Here all the related details of downloading are mentioned. Identifont consist of a number of features to make it easy for the users to search fonts and their complete information. It was developed and designed by a high tech company, Human- Computer Interface. 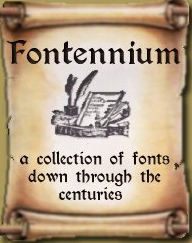 Fontennium consists of a wide variety of fonts. It has different kinds of fonts down through many centuries. The collection of font includes art noveau, Celtic, black letters heavy and lite, Sci tech, modern, egypta, alchemy, magic, roman, unique and artistic. It is a mixture of free fonts and shareware fonts so you should be careful while downloading. It includes various kinds of fonts such as wavy, tall, industrial, liquid, heavy, nice, ornate, gothic, hi-tech, classic, creepy, comic, funky, drippy, fancy, grungy, futuristic, graffiti, messy, liquid, retro, roundish fonts and much more. Here you can get collection of different fonts and can download them for free. When it was setup their main aim was to make it the fastest place on the web to download free fonts. This site contains a wonderful collection of free fonts and dingbats. It is easy to browse and search the font formats on this site. Here you can get over 8000 fonts. If while browsing a site you encounter a font that seems nice to you and you dont have any idea about that font then this site helps you by providing online tools. These online tools fasten up the process of identification. Urban Fonts offers free cool fonts all around. Check out the amazing collection of free fonts on Urban Fonts with over 8,000 freeware fonts available, this is the best place to download your favorite font for free! Read through the font installation section first, before downloading your free font images! 101 Free Fonts first opened its online store in 1998, and has gone on to become a popular free font service. Download more than 10,000 free fonts at the click of a button. All fonts on the 101 Free Fonts service are from award winning designers. A huge selection of fonts are available here for Windows and Macintosh. This site has been designed in such a way that you can easily navigate it and offers you to download thousands of fonts all with a preview. For fast downloading, this site provides you zipped files. Also, you are free to download as many fonts you want.